Ribbon microphones have always been beyerdynamic’s speciality; a tradition which beyerdynamic continues on many fronts and with the TG V90r. The smooth, clear and unbelievably natural sound, the coherent design and its rugged construction – all are unique characteristics that only the TG V90r can offer. Always something special - Ribbon microphones have always been beyerdynamic’s speciality; a tradition which beyerdynamic continues on many fronts and with the TG V90r. The smooth, clear and unbelievably natural sound, the coherent design and its rugged construction – all are unique characteristics that only the TG V90r can offer. As the only ribbon microphone in the world that can stand out even with live vocals on loud stages, the TG V90r is a highlight of the Touring Gear series. 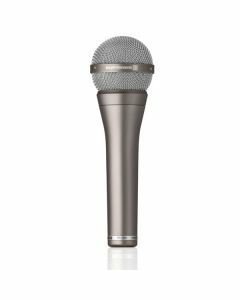 This new interpretation of the legendary M 500 combines the incomparably clear and always unobtrusive sound of a ribbon microphone with the high feedback rejection and ruggedness required for use on tour today. This is made possible by a new system design that achieves a cardioid polar pattern, which is exceptional for a ribbon microphone, combining high output levels with a construction suitable for the stage. The clear, natural sound from this ribbon microphone with a cardioid polar pattern is due to the ultra-light, approx. 2 micrometres thin pure aluminium ribbon that provides exceptional impulse fidelity and outstanding transient behaviour. No other microphone highlights the individuality of a voice like the TG V90r – one reason why it is so loved by vocalists who want something special. In addition to the high-quality craftsmanship, the TG V90r is also impressive with its elegant design and special surface treatment. The complex sound labyrinth of the TG V90r is hidden under the diaphragm and its approximately 2 micrometre thin pure aluminium ribbon which is inserted by hand.